Actually CW, the whole thing is absurd, recoil-wise. And Gorges, slugs in it even more absurd, but the red dot would improve accuracy for sure. For the one and only shot a person would ever fire from it. None of which detracts from the interestingness of seeing it and imagining what it would be like to shoot......keep up the good work, both of you. 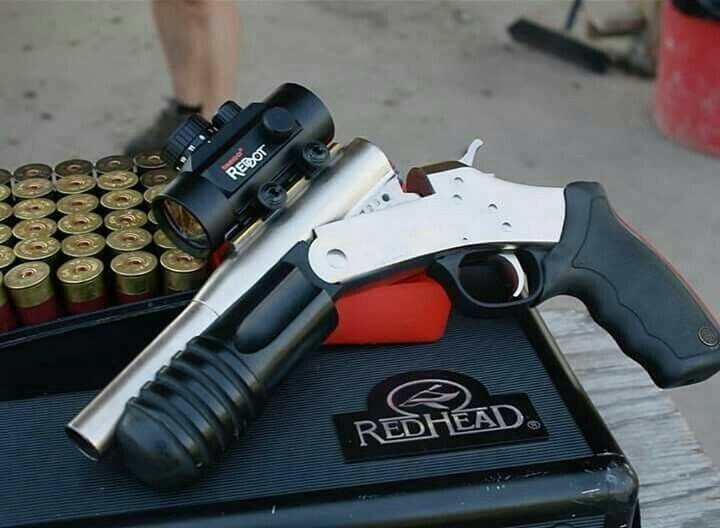 You've taken a shotgun with a 2-3' sight radius, and swapped it for a handcannon with a sight radius (without the optic) of less than 12"). And if that's a large-minute ring, and not a red dot, genius. It's also a short-barreled shotgun, and a $200 tax stamp, let alone a single shot wrist breaker, which is the real silliness in that pic. But if you want to hunt fowl with a pistol, it's definitely more sporting to the birds. The utility for liquor store robberies is somewhat more limited once you fire. Personally I think that the Red Dot is mounted on something that is absurd but as long as it is a legal firearm, to each his own. IMO, an empty cardboard roll held on with some duct tape would be a more appropriate and fitting match. Red dot has gotta help a bit. But the gun seems useless to me. A 22 revolver in your pocket and and UZI or something in your car trunk. AK or something at home. I always liked the pump shotgun short barrel.